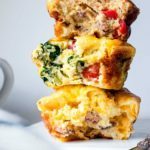 Keto Egg Muffins, 3 Ways! These keto egg muffins are the answer to your “I want to sleep a little longer” blues! 3 low carb breakfast variations: vegetarian, bacon and sausage, so you'll never get tired of these tasty treats! Preheat oven to 350 F and grease a muffin tin with cooking spray. Add bacon to a skillet and cook through. Move to paper towel lined plate. Remove all but 1 tablespoon of bacon fat, and add onion to saute until translucent. Meanwhile, combine eggs, heavy cream, salt and pepper in a bowl. Stir in cheese, bacon and onions. Bake in the oven for 20-25 minutes, or until the center is set. Add breakfast sausage to a skillet and cook while breaking it up with the back of your spoon. Cook until the sausage is no longer pink. Carefully clean the skillet with a paper towel and add 1 tablespoon of veggie oil. Add onion and bell pepper and saute until the onion is translucent. Meanwhile, combine eggs, heavy cream, salt, pepper and low carb taco seasoning in a bowl. Stir in cheese, sausage and veggies. Pour mixture into prepared muffin tins. Add 2 tablespoons vegetable oil. Add spinach and/or kale, and cook until wilted. You may need to do this in batches depending on your pan size. Stir in cheese, cooked veggies, and sliced tomatoes. This recipe stores beautifully in the freezer! The nutritional information is based off 1 of the BACON+ CHEDDAR egg muffins, if you make 12 muffins from this recipe. The other variations will have different slightly different nutritional breakdowns.